Lionel Messi scored a sublime goal to make up for the missed trip to Miami as Barcelona beat Girona 2-0 on Sunday to go five points clear again at the top of La Liga. This was the fixture intended to be played in the United States but any advantage Girona maintained by keeping it at their own Montilivi ground was cancelled out by Messi, and another ruthless Barca display. 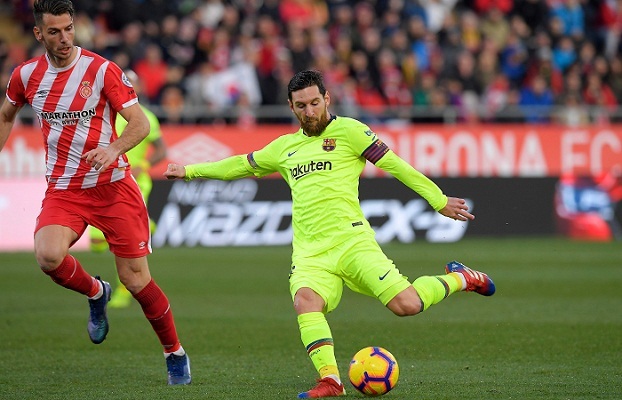 Messi's brilliant finish in the second half, his ninth goal in as many games, came after Nelson Semedo had given the visitors an early lead, before Bernardo Espinosa's red card consigned Girona to 39 minutes with 10 men. The home fans were left incensed by that decision, as well as Messi's reaction they believed had caused it, but the Argentinian's goal offered the perfect riposte. Barcelona restore their hefty advantage over Atletico Madrid, who had cut the gap to two by beating Getafe on Saturday. Real Madrid will have to overcome Espanyol later on Sunday just to reduce their own deficit to 10. Outside the stadium before kick-off, propped up on a railing, was a sign with a scrawled message that read: "Miami, here we come". La Liga had hoped to drag this game there to promote Spanish football and the clubs had supported the idea, with various perks dangled in front of fans, including free flights and tickets, not to mention the chance to be part of something "historic". Girona's home, however, is here and when opposition proved too great, neither team wanted to appear disappointed. "I always felt it was a distant option," Barca coach Ernesto Valverde said on Saturday. The setting probably would have made little difference to the result - just the integrity of the competition - given Girona are now without a win in 10 matches while Barca have managed eight league victories in a row. Girona hustled and harried their opponents in the opening minutes but the goal was soft as they failed to clear three times before Semedo's left foot swept the ball into the bottom corner. Barca were in control and should have made it two, only for Philippe Coutinho to hit the goalkeeper after Messi had sent him clear. Girona survived and then grew into the game. Marc-Andre ter Stegen scuttled forward and back from Pedro Porro's cross and Espinosa should have headed in. Cristhian Stuani was denied by the goalkeeper's legs, with Porro's rebound cleared off the line by Gerard Pique. They had the momentum before half-time but it was checked shortly after as Espinosa caught Suarez from behind and, after protests from Messi, was shown a second yellow card. Messi was jeered and for a while the fury spurred Girona on. Stuani shot and then wanted a penalty while Aleix Garcia almost turned in Cristian Portugues' cross at the near post. But it seemed inevitable Messi would have the final say. Luis Suarez threaded Jordi Alba through, with Messi unmarked in the middle. Out rushed the goalkeeper but Messi's chip was so good, even the diving Porro was powerless to keep it out. Some of Girona's fans, previously furious, now stood up to applaud.